Some of the best advice I can give as someone who is not a personal trainer or anything of the sorts is to make sure you stay hydrated before and after work outs. This keeps everything happy and hopefully prevents some possibly cramping or dehydration issues. Potassium (tomatoes, broccoli, celery, collard greens, prune juice, enoki mushrooms, avocado, dried apricots, bananas) and magnesium (spinach, cacao, brazil nuts, broccoli, dried coriander, dill, flax, okra, spearmint, basil) levels should also be in check. I am all about using high water content fruits and vegetables, especially with juicing. This makes a little go a long way! It helps me stay full, my body and brain is hydrated and ready to go. Citrus fruits, blueberries, radishes, celery, cucumber, broccoli, tomatoes, romaine these are just a few high water content goodies. Consider making them your best friends 😉 try to use them frequently in meals. Please feel free to scope out my site for ideas, I’ve used all of these before and my blueberry recipes or juices tend to be extremely simple. I would like to keep my recipes as simple as possible. What I’ve noticed is that clients and so on tend to think that they need to buy a $500 juicer they saw so and so use. Use what you have and be aware that some modifications with recipes will need to be done. 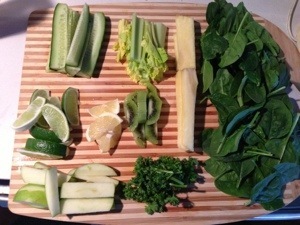 3) If you are making a large batch of juice, split your ingredients into two patches. This helps the motor and blades to break down your food. Plus it assists in getting rid of chunks. 4) One of the big differences between juice and smoothies is that smoothies still have fiber. If you want a juice, strain your drink. 5) With practice you will figure out exact measurements that work best with your machine. It could take just blending it once to see what is working and what doesn’t work. I’ve mentioned this before in a few posts but, by juicing and removing fiber your body can absorb the nutrients better and it gives your digestive system a rest from working on fiber. Thus more time to heal, detox and in a way hit a reset button. For some people it makes very fibrous raw greens easier to digest like kale. With patience and practice creating, eating and loving raw food can actually save you time in the kitchen preparing things. If you are on the go, depending what country you are in or your mode of transportation grocery stores, farm stands and so on are typically easy to find. A meal can be a bag of grapes, several oranges, eating a cucumber like a banana, or a box of mixed greens. Raw veganism can assist in facilitating a greater spiritual awareness. I know from my own experience and some of my friends, yoga and vegetarianism clicked together well, a lot of cases people became vegetarian while strengthening their practice. There is a lot of chatter in our minds everyday, things we think we are craving, negative feelings or words, lack of compassion, the need to stay busy and so on. Becoming in control of your body and loving it will open many doors! Raw veganism can foster a simpler life, this like everything else takes a little tweaking, adjusting, and figuring out what works best for you. Your body will speak to you without using rules that society has made that do not actually benefit you. Just because their was a commercial for a product does not mean that you need it. Instead your body will crave vibrant fruits, vegetables, herbs, seeds and nuts that will strength you. Here is my previous post on what raw/living foods are, why this lifestyle is so yummy, health benefits and living food kitchen techniques. 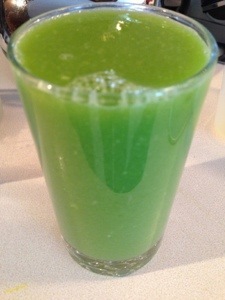 May be because of the parsley and limeade like taste this juice felt very springy to me. The colors, sweetness and warmth gave me a nice awakening like a kick in the caboose to get my body geared up for the day. There are little specks in the juice, that is the pear. Even when pears are juiced their fiberous texture reminds and can be extremely helpful with staying satiated. Optional, I used some pineapple core which equals roughly 1/2 cup pineapple. If you are using a blender I’ve noticed that the core does not want to blend, so I wouldn’t recommend trying it. It leaves hay-like strands of fiber in the juice. « Ways To Stay Inspired & Get Motivated Wherever You Are On Your Journey. So a question I constantly ask is why juice when the only difference is losing the fiber? I’ve mentioned this before in a few posts, by juicing and removing fiber so your body can absorb the nutrients better and it gives your digestive system a rest from working on fiber. Thus more time to heal, detox and in a way hit a reset button. For some people it makes very fibrous raw greens easier to digest like kale.